It was with great pleasure that Past President Paul Wurz presented Jake and Claudia Ellis with the American Rhododendron Society Bronze Medal for outstanding contributions to the Chapter. The Bronze Medal is the highest commendation awarded by a local Chapter and was presented on June 11, 2016. Jake first joined the North Island Chapter in 1986 before leaving for work in Kamloops in 1988. Returning in 2005, Jake and Claudia re-joined and began actively participating in club activities and events. Claudia served as our “Sunshine Lady” for several years making sure that members were recognized by the club when needed. As a team, Claudia and Jake ably looked after the Social responsibilities for our meetings and at Chapter events. Claudia is currently on the Executive serving as our Treasurer. Her organizational skills and level-headedness, along with her warm manner and sense of humor, are true assets to the club. As Vice President and then President, Jake has been an outstanding leader keeping the club on track and running efficiently. In addition to his administration skills, Jake added a special touch of humour that encouraged participation and a positive social context at the meetings and club functions. In his role on the Executive, Jake attended the District One President’s meetings as well as acted as the NIRS representative for the development of the species garden at Milner Gardens in Qualicum. Over the last year Jake was also editor the club Newsletter, and brought to it his unique humour and writing style. 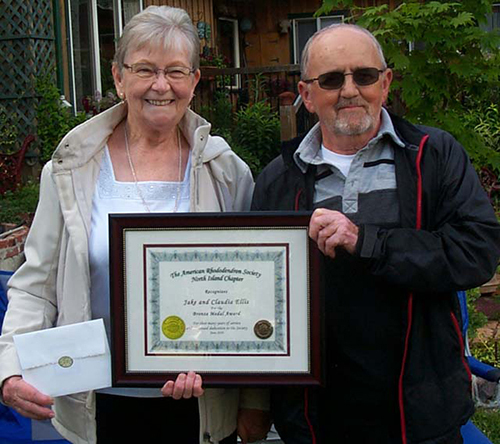 Both are regular workers at the Comox Valley Rhododendron Garden, participate and assist with our fundraising Garden Tour and Rhodo Sale, are energetic members of the newly formed Propagation Group, and attend club activities and events. For their extensive contributions and support, the members of the North Island Rhododendron Society were pleased to award Claudia and Jake Ellis with the ARS Bronze Medal. Congratulations to them both. The Bronze Medal was presented as part of a framed certificate stating: “The American Rhododendron Society North Island Chapter Recognizes Jake and Claudia Ellis for the Bronze Medal Award for their many years of service and continued dedication to the Society. June 2016”.